Me and my cat jumper in London. Red jumper meets equally red phone box. Hello Kitty, have you seen my choker necklace? Sometimes you accidentally dial the wrong number, but with this jumper you can't go wrong. Also from the back a lovely view. Have a look at the cute toes! This shoes carried me around the whole city without itching feet and with lots of compliments. I'm back with you after a wonderful week in London. We did a lot of fabulous things like visiting the Harry Potter Studios, seeing amazing exhibitions (Tim Walker at Somerset House and Hollywood Costume at the V&A) and going to a concert of El Perro Del Mar. I met all my London friends and this warmed my heart. When we came back my head was full of lovely memories and my suitcase stuffed with my shopping finds. You can have a little sneak view into my shopping bags later, for now I show you a casual outfit, perfect for a city trip. I wear comfortable shoes for walking around and clothes easy to get off in the changing rooms. In my opinion, casual doesn't mean plain and without fun and this cat jumper fulfills my wishes. Combining the jumper with gold dot tights, golden shoes and a bright red lipstick add a hint of elegance. If there is something like a London shoe it must be a creeper! 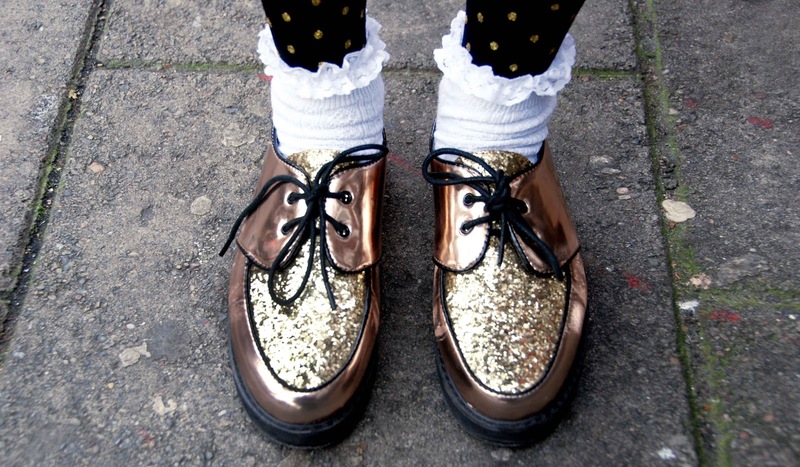 This sparkling version goes very well with my current obsession for frill socks. A lot of people couldn't keep their eyes of this shoes and I was asked many times where to get them. I'm happy to be back here and excited about planed future posts, but a little bit sad at the same time. Leaving London always gives me a feeling of loss and it takes a few days to settle in again. What I like most about London are the open minded people. I always feel welcome and free to be whatever I can think of. I got loads of compliments for my outfits in London, while back in Switzerland I often face people laughing about me behind my back (or even worse: into my face). This doesn't change me, because I am a stubborn girl and stick to my taste, but it's not encouraging neither. But don't be afraid: Regular visits to London and your wonderful comments will prevent me from giving in and hide myself behind gray mouse outfits. Let's keep it colourful and sparkling! Most of the items in this outfits are not available for online shoppers, but in the box beneath you find my suggestion how to recreate my style with similar items. 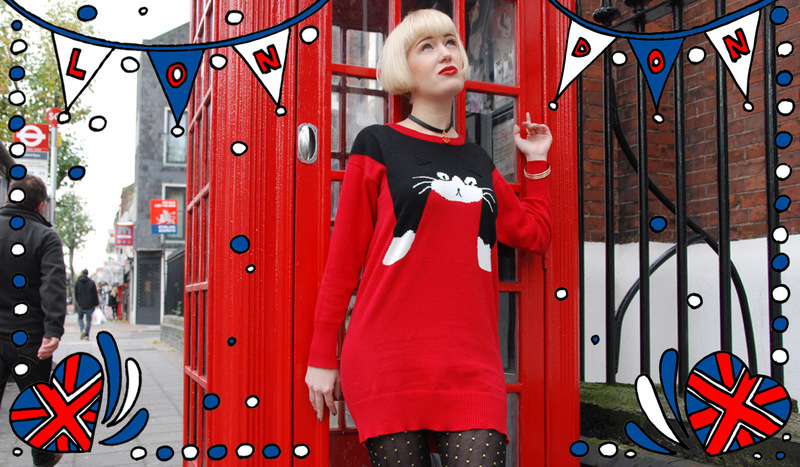 Unfortunately there is no other red cat jumper around, but I think the black or white one will look great too. Love love your creepers ! The sweater is so cute and fun !! das outfit gefällt mir richtig richtig gut, besonders die schuhe in kombo mit den söckchen sind mal wieder der absolute knaller ! Loving everything you are wearing, my gorgeous Sara, and so glad to have you back. Huhuuu Sara, schön bist Du gesund und munter zurück! Als ich die Fotos ansah dachte ich; in London bist Du sicher nicht aufgefallen... Dass dich aber Leute bei uns auslachen wegen deine STIL's find ich unverschämt und zeigt nur das kleine Niveau dieser Leute! Du bist und bleibst Styling Queen No. 1!!! I love the kitty sweater! And those leggings are adorable. You look great. p.s. Btw, this is Alejandra, from Musings in Red. I've split my old blog into two: an inspirational blog, "Parasol Dreams", and a book review blog. Hab dir mal einen kleinen Blogaward verliehen. 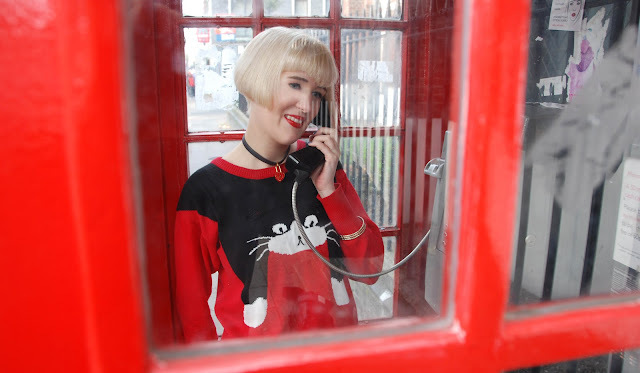 Since I've started shooting outfit pictures I've been dreaming of having one in such a red phone box... Are thinking of moving to London one day? Kitty love!! So adorable!! have fun In London!! u have so amazing style and look pretty! Wonderful photos, that jumper is so fun! This is a common question in folks, and you've made it so easy! :-RRB- I am hoping the exact high-grade website post out of you in the future . Is going to be incessantly in order to inspect new posts. This Stuff is very easy to read, and you are sufficient in presenting at the subsequent paragraphs, also I do think by accomplishing so different subscribers that additionally feel. Thank you due to this helpful information, and could be useful related to others.